During the Holidays I'm always inspired to wear as many sequin/glittery/shiny things I can. And, over the years I've tried to buy a few items that I'd actually wear again and again instead of buying something new every Holiday (although this always ends up happening!). A couple of years ago I got a black sequin skirt from J.Crew that I love. I wore it on NYE very simple with black tights, a black tank and a chunky sparkly necklcace, but this year I thought I'd recycle the skirt and spice up the outfit a little more. 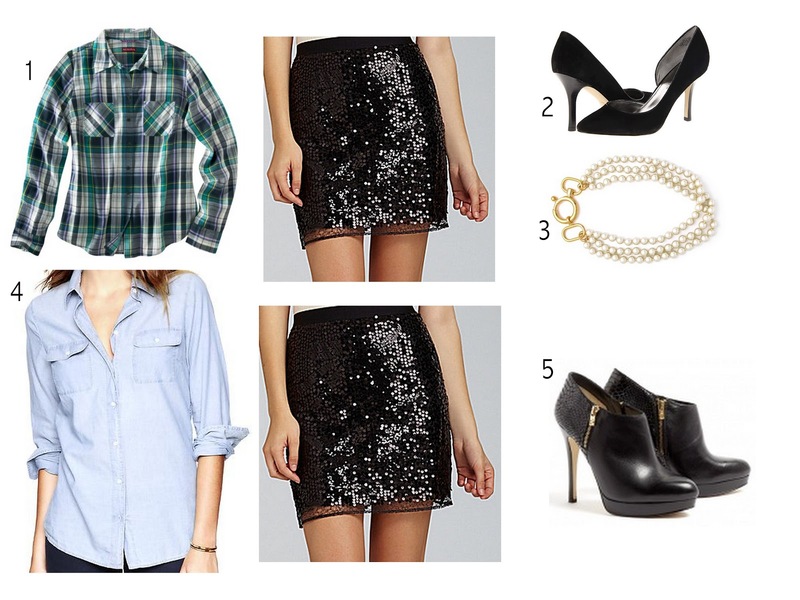 I also like the idea of wearing it with a chambray shirt, possibly a sweater on top and some cute booties! fun fact: The word "sequin" comes from the Venetian zecchino, which was a coin issued in 1284. When the currency died out, Venetian ladies would embroider their clothes with the old, pure gold coins. Thus, bling is born. My daughter has a skirt just like that! What an interesting fun fact!